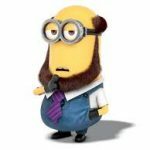 With the ISA deadline now less than a month away, it is time for anyone who hasn’t yet used their allowance, and is able to do so, to get cracking. The 2017/18 tax year finishes on April 5th and after that cut-off point any unused portion of your annual £20,000 ISA allowance will be lost. In addition to choosing the most suitable mix of investments for your ISA, which will vary depending upon your personal financial and investor profile, it’s important to choose a suitable provider. That’s especially the case if this is the first year in which you will be contributing towards an ISA. But even if you have an existing ISA account, or accounts, it doesn’t mean that you shouldn’t be actively assessing whether or not there isn’t a more suitable option for this year. Consolidating ISAs held with different providers is also easy and will almost certainly save you some money on fees. There’s a rich choice of ISA providers and ISA formats available. These vary in the range of investments offered, format (DIY, advised, robo-advice), added value resources, quality of platform, minimum investment levels and pricing structure. That’s a good thing and means that there is competition and choice and the most suitable providers and formats will vary from person to person. But it also means settling upon the right choice can be daunting and require some time to be allocated to research. With that in mind, this guide is intended to help focus and narrow down that research. It focuses on stocks and shares ISAs rather than cash ISAs, though many providers offer both. Stocks and shares ISAs also now usually allow for a cash allocation, though the interest rate offered is usually poorer than is the case for dedicated cash ISAs. As such, it may well make sense to hold cash that you intend to keep as cash and not drip fed into investments separately. If you aren’t in a position to use both your full ISA (£20,000) and SIPP (£40,000) allowances, and let’s face it, most of us aren’t, then you should first assess into which wrapper you will allocate funds. You can of course, and it may well make sense to, split the money you are able to set aside and pay into both an ISA and a SIPP. If your investments and savings are earmarked for your retirement, or later life (you can now access a SIPP and other pension products from the age of 55), then paying into a SIPP or other personal pension probably makes more sense. Investments into pension products take advantage of government top ups which essentially compensate the income tax you will have paid on the funds. However, this means the capital is locked up until you are 55. If your invested savings, or a part of them, are intended for a shorter term goal (there is a high probability you will want to use them before you reach the age of 55) then an ISA is the wrapper for you. When you pay into an ISA, either a stocks and shares ISA or cash ISA, you don’t pay any tax on dividends, capital gains or interest. In future years, if you make withdrawals from your ISA these also won’t count towards your taxable income for the year. For those in higher income bands, or who have already started to draw from a pension, ISAs are also often the only choice if reduced pension allowances have already been used. As of April 6th 2016, every £2 earned over £150,000 per annum results in a £1 cut to the £40,000 annual pension allowance. This means anyone earning over £210,000 has their pension allowance capped at £10,000. The lifetime limit that can take advantage of pension tax incentives is also now £1 million, reduced from £1.8 million since 2012. For those already drawing from a pension, the cap on what can be paid in per year is £4000. In brief, ISAs provide greater flexibility for anyone who wishes to have easy access to their savings before the age of 55 and higher earners, while still offering tax efficiencies when compared to standard investment or savings accounts. Stocks and shares ISAs fall into two main categories (excluding Junior ISAs): the Lifetime ISA and standard Stocks and Shares ISA. Lifetime ISA (LISA): this is the best option for anyone over 18 and under the age of 40 (the cut-off point for opening a LISA) who wants to save towards either the deposit on a first property or retirement. The annual limit is £4000, but the remaining £16,000 of the £20,000 annual ISA allowance, can be paid into a standard ISA account. The lifetime limit that can be paid into a LISA is also £8000, not including any returns made on investments bought with the cash paid in. LISAs take advantage of a 25% government top-up to funds paid in, which means £4000 paid in becomes £5000 and the full £8000 allowance, £10,000. The limitation is that the funds in a LISA can be withdrawn before the age of 60 (five years later than a normal pension) only if being put towards purchasing a first property. 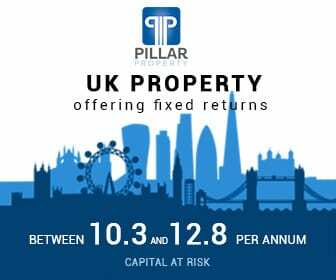 If a LISA holder intends to buy their first property within 2-3 years, it is better to opt for a cash LISA than stocks and shares LISA as the value of investments wouldn’t have time to recover in the event of a markets downturn. Stocks and Shares ISA: the standard Stocks and Shares ISA format doesn’t come with a 25% top-up but does mean no tax will be paid on returns or withdrawals. They also come with a £20,000 annual allowance and funds can be accessed when the holder wishes. Flexible Stocks and Shares ISA products (they are not all ‘flexible’ so check your choice is if preferred) also allow funds to be withdrawn and returned within the same tax year if any unexpected expenses crop up. Cash paid into a Stocks and Shares ISA can be invested in a range of different kinds of approved investment products such as shares, ETFs, funds and investment trusts. As a rough rule of thumb, if an online stock broker, fund supermarket or robo-advisory platform offers the investment it can probably go in to a Stocks and Shares ISA. Not every platform offers the same range of investment options so it is important to check the choices available meet your needs when selecting a provider. Online Budget Stock Broker: online budget stock brokers, as opposed to DIY investment platforms, are usually no-frills stock broking services that offer low fee shares trading. They will often also offer ETFs and even sometimes a limited range of funds. This kind of service is intended for regular share dealers whose higher trading volumes mean low fees are important. An ISA with an online budget stock broker will be the suitable choice for confident, experienced investors who are willing and able to invest the time in building and managing their own investment portfolio from individual company shares and ETFs. Unfortunately, this kind of discount stock broker doesn’t always offer ISA wrappers, though Halifax’s iWeb is one that does. Fund Supermarkets: fund supermarkets are, as the term would suggest, platforms that offer a wide choice of funds from different providers under one roof. 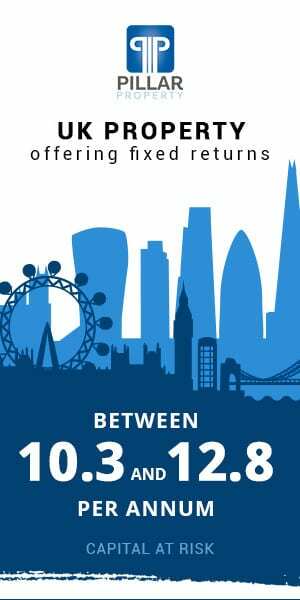 Ideal for less experienced investors or simply those that prefer the option of managed funds and investment trusts rather than the time commitment of putting together a diversified portfolio themselves from individual company shares and/or ETFs. The drawback of fund supermarkets is that they only offer funds and investment trusts and not individual shares and ETFs. Online DIY Investment Platform: the most common type of provider of Stocks and Shares ISAs is online DIY investment platforms. These can be considered as combination of a stock broker and fund supermarket and offer the widest range of investment options within Stocks and Shares ISA products. The most all-round choice of provider. This kind of platform tends to be best suited to investors with at least a little bit of experience, or are will to do a little research on fund and/or share choices. However, some also offer ready-made funds and fund portfolios for beginner investors. Robo Advisory Platform: a relatively recent development, robo-advisory platforms don’t offer advice as such but are like a decision tree that profiles your financial situation and investor profile based on information you provide. These platforms then match you to one of a range of investment portfolios based on ETFs. These are a good choice for beginners or those who simply want to have a diversified portfolio that fits their personal profile put together for them but don’t have a large enough portfolio value to justify the expense of paying for a personal financial advisor. 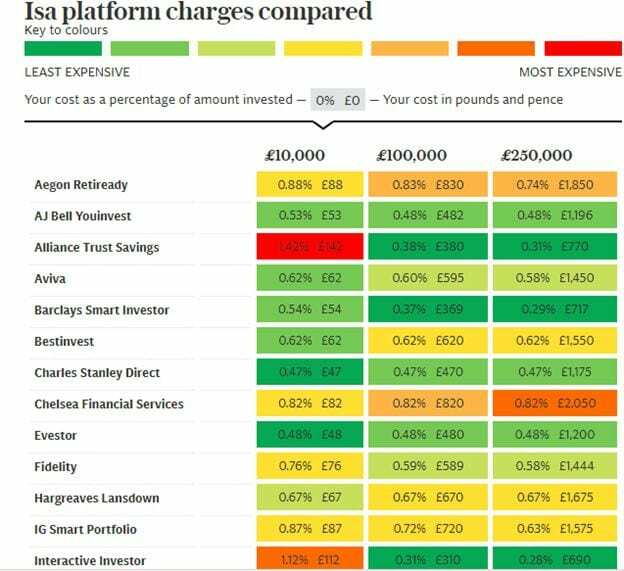 Nutmeg is the largest robo-advisory platform in the UK in terms of assets under management and has a, albeit with limited history, pretty good record on how its portfolios have performed. 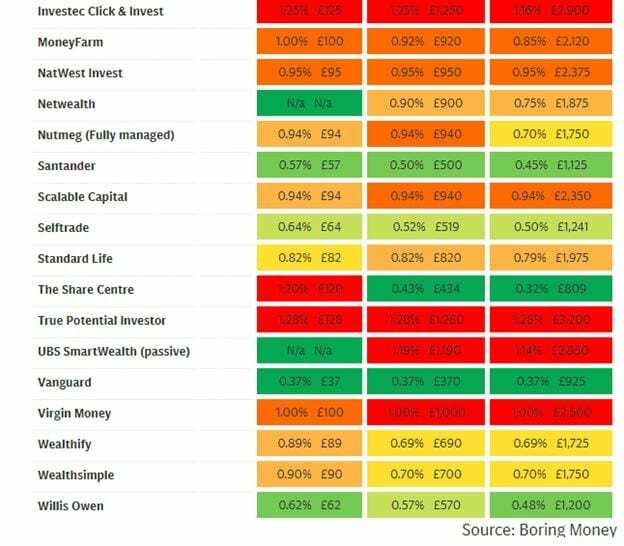 More recent market entrants such as Wealthify, MoneyFarm and Scalable Capital (which, unlike the others, has a minimum starting level of £10,000) are also good products and have delivered good returns over their short histories. Which is the Best ISA Providers for You? Will Trump Trade War Fears Spark Another Stock Market Sell-Off? UK Stock Market Out of Favour with International Investors: Should You Be Jumping Ship Too?